Where is it? : This park lies between the suburbs of Bellevue Heights and Flagstaff Hill along the Sturt River. Car parking is available along Broadmeadow Drive, Flagstaff Hill and at the end of Mountbatten Road, Bellevue Heights. The Sturt River Flood Control Dam within the park is managed by SA Water. Property summary: Total area 435 hectares. Hundred of Adelaide – Sections 625, 674, Allotments 5 (Deposited Plan 35923), 9 (Deposited Plan 56671), 156 (Deposited Plan 9272) ; Hundred of Noarlunga – Sections 1556, 1561, 1648, 1649, 1665, Allotments 3 (Deposited Plan 61457), 51 and 52 (Deposited Plan 29010), 156 (Deposited Plan 9272), 300 (Deposited Plan 92272); Hundreds of Adelaide and Noarlunga – Allotments 1 (Deposited Plan 56671), 4 (Deposited Plan 35889), Allotments 101 and 103 (Deposited Plan 94899), Allotment 6000 (Deposited Plan 113177). History: Sections 625, 674, 1549, 1556 and 1561 were proclaimed as Sturt Gorge Recreation Park on 4 October 1973. Sections 1648 and 1649 were added on 30 May 1985; Allotment 103 on 14 November 1985; Allotments 1, 4, 9, 52, 156 and 198 on 16 August 2001; Allotment 3 on 15 May 2003; Allotments 5, 51, 101, 300, 613 and 6000 on 19 December 2017. Section 1549 was excised on 15 May 2003. Habitat: The park conserves the second largest remnant area of grey box (Eucalyptus microcarpa) open woodland managed by DEW. Along the river there is river red gum (E. camaldulensis). 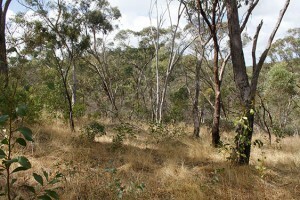 North of the river there are areas of drooping sheaoak (Allocasuarina verticillata) woodland over twiggy daisy-bush (Olearia ramulosa) and sticky hop-bush (Dodonaea viscosa). At the western end of the park the habitat is mostly exotic and some native grasses. This area has been partially revegetated.